Sheet Pan Mustard Chicken with potatoes, apples, and cranberries is an easy meal, ready in less than an hour, and so fragrant! 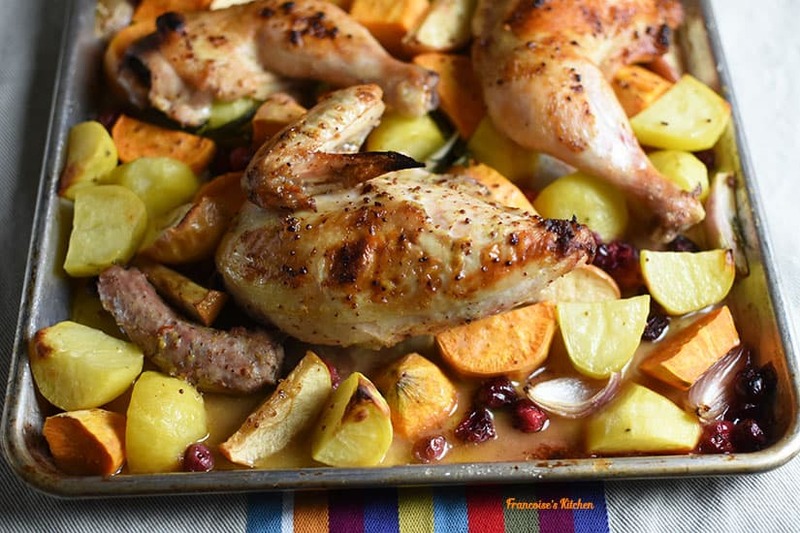 What I love about this type of recipe is that you cook an entire meal in a single dish that you leave in the oven without worrying too much and cleaning it up is a breeze. The chicken has a beautiful crispy skin and flavor, after dipped in the mustard apple cider mix, and deliciously enhances the dish with the rosemary herbs. Cut the whole chicken into pieces. Pat the chicken dry with a paper towel. Salt each piece on both sides. Peel the sweet and gold potatoes and slice them into ⅓-inch rounds. Peel the shallots and cut into 4 wedges. Cut the apples into 8 wedges. Place all of this on a sheet pan, add cranberries, and rosemary, toss with olive oil and salt. In a bowl, whisk together: ½ tsp of the salt, the vinegar, 2 tbsp of the olive oil, the brown sugar, mustard, and red pepper flakes. Take each piece of chicken and dip it into the sauce and place it skin-side up on the sheet pan. 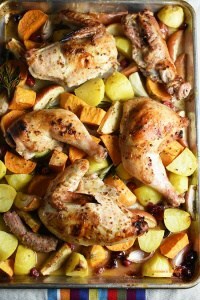 Roast for 40-45 minutes until the chicken reaches an internal temperature of about 160°F and the potatoes are tender. Take the pan out of the oven and let it rest for about 5 minutes before serving.